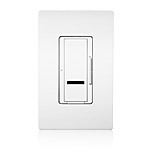 At the touch of a button, dimmer can go immediately to a favorite preset light level, fade to off, or adjust manually. Remote control allows users to control lights from across the room. 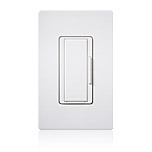 At the touch of a button, dimmer can go immediately to a favorite preset light level, fade-to-off, or adjust manually. For fan controls, users can similarly cycle between favorite speeds or adjust manually. Remote control allows users to control lights and fan from across the room. 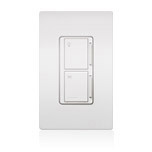 For true multi-location dimming, use up to nine companion dimmers with one Maestro IR multi-location dimmer. 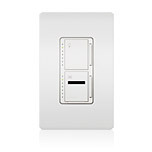 For true multi-location dimming, use up to two companion controls with one Maestro IR multi-location fan/light control.